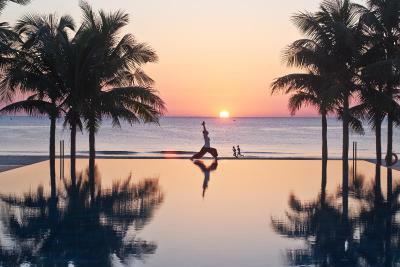 Lock in a great price for Fusion Maia Resort – rated 8.7 by recent guests! The villa was very spacious and comfortable. Nice pool and restaurants. Our Fusionista, Vu, was extremely pleasant and helpful. Breakfast was very good so was the coffee. Spa and massage quality was above average although 2 sessions per day per person was maximum (instead of unlimited spa as it was famous for), arguably if you're paying the room premium just for the massage think twice as you'd most likely get massage outside the resort at a much cheaper rate than the premium. Fantastic breakfast, great food quality overall, lovely location right on the beach, relaxing spa with skilled therapists. Beautiful accommodation, staff, service. Spa was incredible. Breakfast anywhere anytime is a differentiator. Spa treatments, fantastic food in the main restaurant, lovely staff and the best heated pool next to the spa for your morning swim. Vietnamese coffees in the morning are a must! The breakfasts, served anytime, anywhere, were fabulous. Staff were friendly, helpful, and spoke good English. The other visitors there were calm and quiet, even those with young children were able to conduct themselves in a manner that was undisruptive to the overall zen environment. A very relaxing place for a short pampering getaway and great for couples. Overall this place has a lot of potential and a great concept, but the detailed execution and logistics really needs work to deliver the type of understated luxury experience they are going for. Breakfast anywhere anytime is a very good concept, can enjoy breakfast at different location with different types of food everyday. The spa is good, the therapists and staff are helpful. The guests at this hotel are mostly couples, making the place very quiet and relaxing. The infinity pool and beach are amazing. We liked most aspects of our stay at Fusion Maia, in particular: 1) beautifully designed rooms and grounds, including the beach area, 2) all-inclusive spa, 3) that the place didn’t feel crowded even at full capacity, 4) excellent selection of quality food and drinks as part of half-board, 5) polite and helpful staff. Fusion Maia Resort This rating is a reflection of how the property compares to the industry standard when it comes to price, facilities and services available. It's based on a self-evaluation by the property. Use this rating to help choose your stay! One of our top picks in Danang.Located on the beautiful My Khe Beach, Fusion Maia Resort offers complimentary spa service in the most extensive spa facilities in Central Vietnam, equipped with steam baths and sauna facilities. This beachfront resort features 5-star villa accommodations in Da Nang and an outdoor pool with a waterfall. Boasting private courtyards with stunning sunset views, each modern Vietnamese-style villa has spacious layouts and a open-plan living room. Large bathrooms have oversize windows and separate bath and rain shower areas. Guests can enjoy a dip in the villa's private pool. All-day breakfast can be served on the beach or at the spa area. Five restaurant offers Pan-Asian dishes while Fresh serves up seafood by the pool side. Light refreshments are available at Tonic lounge. Fusion Maia Resort is within a 15-minute drive from Hoi An Town and Da Nang International Airport. It is easily accessible from nearby attractions like Thu Bon River, Marble Mountain and Japanese Bridge. When would you like to stay at Fusion Maia Resort? This villa consists of of a master bedroom, fitted with an private bathroom with a bathtub and shower facility. There is an open-plan living room with sofa, outdoor courtyard and a private pool. Featuring a private plunge pool, this villa is fitted with 2 bedrooms, each with an attached bathroom with a bathtub or spa bath, and shower facility. It also has an open-plan living room, dining area and an outdoor courtyard. This villa is fitted with 3 bedrooms, including 1 master bedroom with a bathtub and 2 other bedrooms with a shower. Spacious villa offers an open-plan living room, and kitchenette overlooking the private pool and the ocean. House Rules Fusion Maia Resort takes special requests – add in the next step! Fusion Maia Resort accepts these cards and reserves the right to temporarily hold an amount prior to arrival. You must show a valid credit card upon check in. This credit card must be in the same name as the guest's name on the booking confirmation. If payment was made by a 3rd party at time of booking, this card holder must contact the property prior to arrival to provide authorization. Please note that there is a neighboring property construction taking place next to Fusion Maia Resort. The property apologizes for any inconvenience caused. SPA service time is merely from 9am to 10pm. If it can open from 7am to 11pm, more options for customers. Food selection for vegetarians/vegans etc. could be better. There is currently a hotel under construction next door and building works taking place here throughout the day and into the evening. It's very noisy during the day - even over the other side of the resort you can still hear the work going on which is quite off putting when you are trying to relax. We could even hear the banging and drilling while we were having a massage in the spa. Though we had a lovely stay, it would have been nice to have known about the building works in advance just to manage expectation, as it defintely had an impact on the peace and quiet which is a real shame. We asked to move rooms to the other side of the hotel which did help a little though, and the staff were very accomodating and apologetic about the noise. The devil is in the details and in this case, those details could really use some fine tuning. For starters, the key selling point for most people is probably the “unlimited” spa treatments included in the room rate. Trouble is that the real situation of booking the spas can be quite stressful. You can only book and confirm the first two treatments of your trip. After that, each day, you must first complete your first two treatments before booking a third treatment for the day. However by then, you will likely be told there is little to no more availability for the rest of the day. Their scheduling software must be complicated and inefficient because the spa booking staff always look stressed out when trying to book you in. So it’s really not as “unlimited” and relaxing as one would have hoped. The spa treatments themselves are either 50mins or 30mins, each type counting as “one treatment”. What I didn’t like is if your 50min appointment was booked at noon, for example, the hosts do not start to greet the noon guests until 12:00 on the dot. They bring over the therapists to each guest, who then lead you to your treatment room. Since there are many guests starting their treatments every hour, it might take the host five minutes to work her way to you, and then another five minutes to walk to the treatment room. So by the time you settle time it is easily 12:10, leaving you with a short 40min treatment time. The quality of the treatments itself is quite good but the spa logistics really need some work. It would be much better if guests could be greeted 5 to 10mins before the appointment time, but in the three days I was there, this was never the case. The rooms itself were a bit on the old and tired side, and we did have some unwelcome visitors: a cockroach and some mosquitos who kept me up one night. Liked the firmness of the bed, the villa was spacious, pool was very clean, spa treatments were great, and overall the staff were very friendly and polite. The food was good too! The room seems to be dated, we have a broken toilet seat that needs to be fixed. Villa near the access road is very noisy. Most of the staff are friendly, but there was a room service server who has been very rude and impatient when responding to our request for extra plates and utensils for sharing food. Make sure to pre-book the complimentary massage you get before checking in! Since they are not that flexible in rescheduling. Music selection played at the restaurants / bars on some nights - tired global pop hits. A more tasteful / original music befitting the atmosphere of a sophisticated oasis-like resort would be more appropriate. No English breakfast tea bags in the room, only Earl Grey. Included massages were probably not as good as if you'd paid a la carte and always seemed a bit shorter than the promised 50 mins. The spa discourages back to back massages ie 100 mins at a time. The phone shortcut keys (room service / operator / etc.) did not work. So we had to find the numbers to call through the other leaflets and menu. We had some water leakage problem during our last night at the hotel and the toilet had water puddles. But they did send someone to come to try fix the problem, even though it was already around 11pm, and offered to change our room. We are not early risers, so the breakfast anytime and anywhere was a great treat, we had breakfast delivered to our room, which mean no rushing for breakfast and made our stay even more enjoyable and relaxed. The beach was spotless and clean, the lounge chairs was kept in good conditions. They even noticed it was my birthday and prepared a birthday cake to be sent to our room. What a stunning beautiful hotel. We picked the Fusion Maia for our honeymoon based on previous recommendations. We only had four days in Vietnam and couldn't have picked a better place to stay. Everything felt so personal, the staff were so friendly and ensured our time was as relaxed and simple as possible. There were lots of lovely touches, with special platters being delivered to our room and lovely messages left. The spa treatments were exceptional and it was fantastic to have these included. Our apartment was beautiful, it was so nice having a private pool and it is completely private/not over looked at all. The food was delicious but more importantly the cocktails were excellent! We loved our time here and would recommend anyone to spend their honeymoon here. It is very reasonably priced, especially when you compare to other honeymoon hotels in places like the Philippines. Loved this hotel! Stayed 4 nights in April. Everything was perfect: delicious food with varied menu of Vietnamese and western food. Spa treatments were some of the best I’ve had. Rooms beautifully simply, calming decor. Staff so pleasant! Shuttle bus to Hoi An also a must. Lovely chilled atmosphere of couples and young families. Beautiful treat for our honeymoon trip to Vietnam. Staff were great all round and the included spa treatments were incredible. Rooms were high quality, clean and every room was a private sanctuary.